The full-time residents of Kithoka Amani Children’s Home (KACH) attend an academically strong, local primary school. We encourage and expect academic excellence. If you come visit, you will see all the kids huddled around a very long table after dinner each night doing their homework. The children all earn grades in the A-B range, and the strong rankings in the district set our children apart. We understand that to truly break the cycle of poverty, higher education is needed. 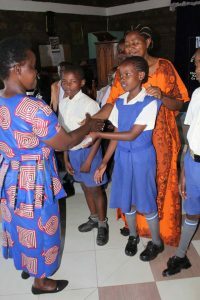 Once the children reach secondary school age, most are accepted into boarding schools, which are located far from KACH. However, these schools provide a gateway to a university education. The kids always return for holidays and summer breaks. 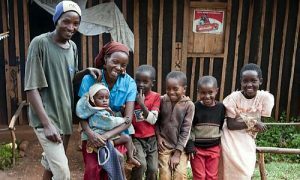 Karambu has kept her initial promise to dying mothers like Gladys – and others – to make every effort to provide a quality education to these children. Our grounds serve as a gathering place for leadership training and empowerment programs for members of the community. These programs provide the children a very communal environment where something important is occurring each week and they interact with other young people and elders and continually learn from them. Please visit our Video Gallery to see more IPI videos. Among the poor in Kenya, income and quality of life aren’t much better for those who complete high school compared to those who don’t. To overcome poverty, further education is needed after high school in order to obtain vocational skills or professional credentials. The IPI College Scholars Program (ICSP) supports promising candidates in attaining post-secondary vocational training and bachelors degrees. We pay school fees and living expenses, when needed, that enable individuals and families to break the cycle of poverty. Since ICSP was founded in 2006, the program has supported more than 30 students in obtaining their undergraduate degrees in teaching, medicine, and business. Several students have gone on to self-fund master’s degrees and doctorate degrees. ICSP has raised over $100,000, all in private donations. Evans is one of our current IPI College Scholars and he has started peace forums at his university (Kenyatta) and around Meru. He is majoring in math and engineering and is an outstanding student and leader. Evans was rescued along with his younger brother who is still living Amani Home. We are proud that he is a member of our IPI family. For those children who are not living at the Amani Home, but due to family hardships do not have the opportunity to attend school, IPI has a separate education fund to pay for expenses such as school fees, books and other materials. This will help these children, many of whom have lost parents to AIDS, to stay in primary and secondary schools. It also allocates resources for care and support initiatives by the families enrolled in the project.